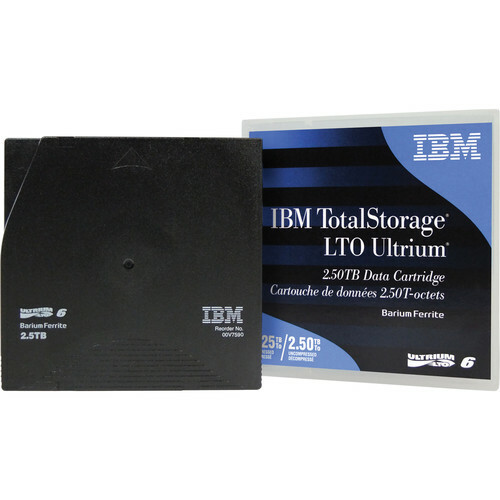 The LTO Ultrium 6 Data Cartridge from IBM is designed to help organizations manage explosive data growth, sustain rapid and reliable access to data, and ensure business resilience. The LTO Ultrium 6 Data Cartridge features 2.5TB of native capacity and 6.25TB of compressed capacity for efficiency and performance. The capacity helps reduce the number of cartridges and the amount of equipment, space, and labor associated with tape-based data storage. The cartridge offers device-level data encryption to ensure data privacy, and reduces the risk of data corruption due to a virus or sabotage. The LTO 6 supports tape partitioning and Linear Tape File System making tape storage an even more compelling solution for data protection and preservation. Box Dimensions (LxWxH) 4.5 x 4.3 x 1.1"